‘Five charts‘ and ‘five more charts‘ were two of the most read articles on InsuranceLinked so in the spirit of democracy and imaginative titles, here is some more data on M&A and other goings-on in the reinsurance market. M&A fever is back this year as AIG and AXA offered hefty takeover premiums for Validus and XL. This chart shows the price/tangible book of publicly traded companies that write a significant proportion of reinsurance premium. The bold lines identify companies that have been bought. Acquirers have (mostly) been price sensitive and targeted the cheaper firms. Though buyers may now be forced to pay more as the number of available reinsurers dwindles. 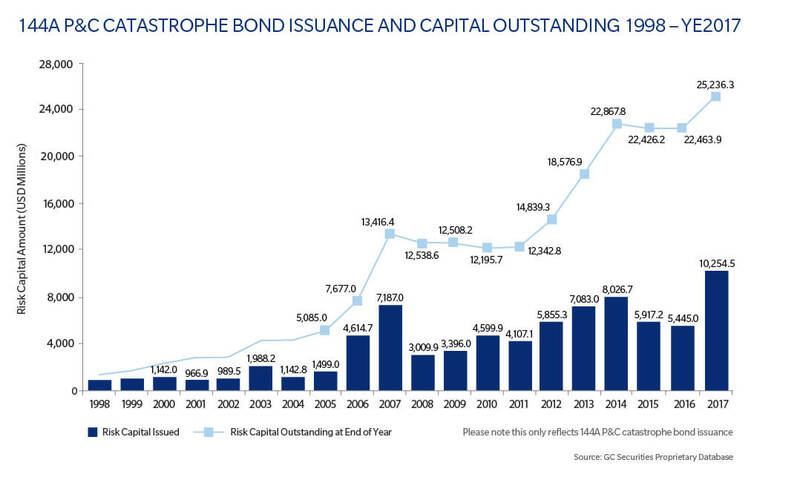 According to the latest numbers from Guy Carpenter, the size of the catastrophe bonds market reached a record high of $25 billion at the end of 2017. This is a growth rate of 88% compared with ten years ago. 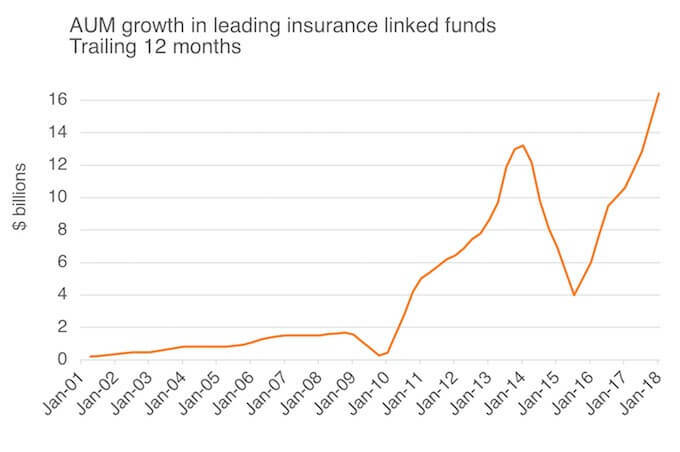 The assets under management of the major insurance-linked fund managers has grown much faster. In the last ten years, fund AUM has grown by over 1,000%. 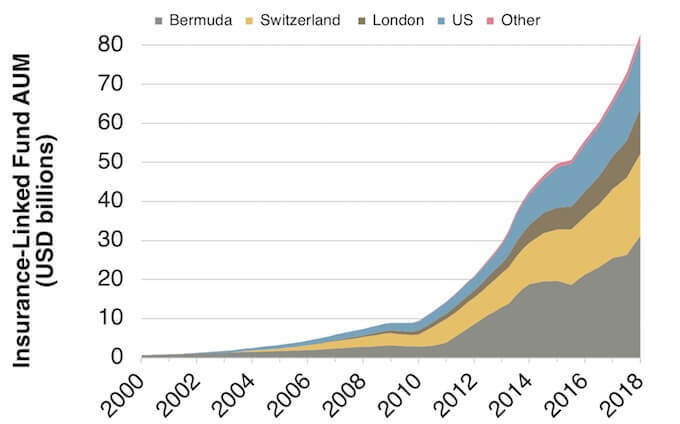 Managers with headquarters in Bermuda and Switzerland continue to control the bulk of the assets. This chart is an update of the one in this report. Despite last year’s losses and redemptions, funds grew at a record pace in 2017. 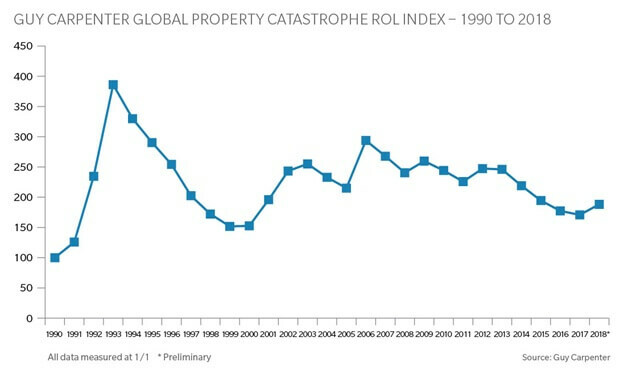 But reinsurance funds still account for less than a tenth of a percent of global assets under management. Guy Carpenter’s rate-on-line index indicates that 1/1/2018 pricing was between the levels experienced in 2015 and 2016.